While everyone else I know is savoring some sunny weather, it is still chilly and grey here in London. 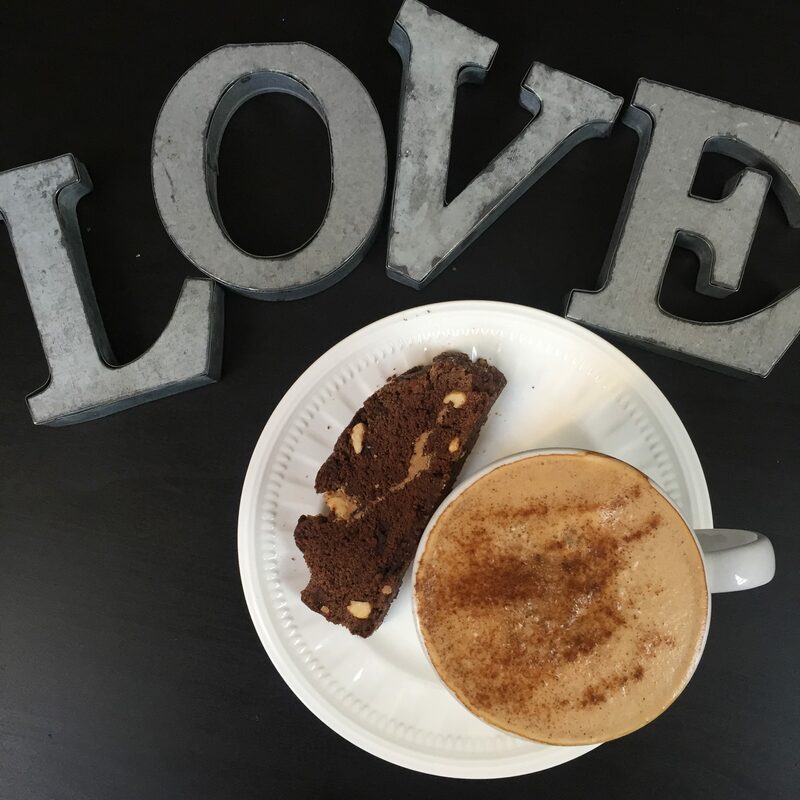 The perfect hot coffee and sweet treat kind of day. Which fits perfectly with my Woman Crush Wednesday! 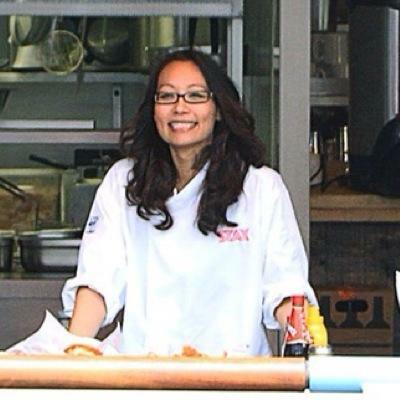 Because I am going to be showering the amazing chef Bea Vo with some love, and baking her Chocolate Peanut Butter Biscotti. 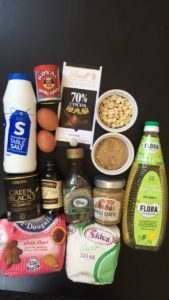 My peanut butter addiction is well documented here on the blog. But I can say it isn’t unusual for Americans. 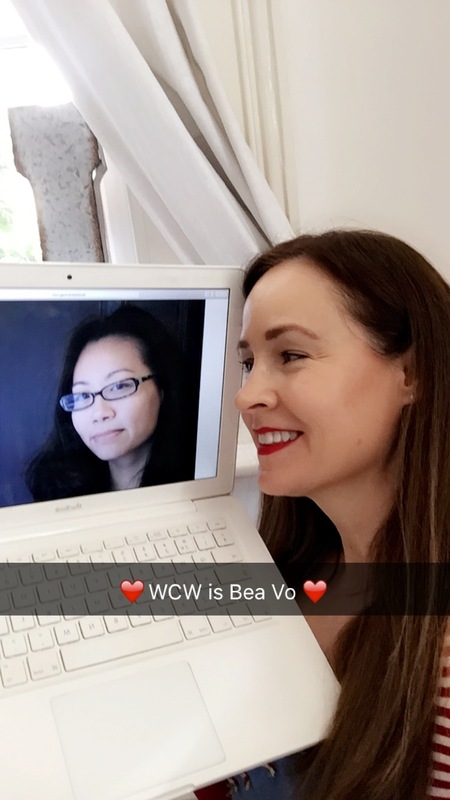 Hence it makes sense that today’s WCW Bea Vo is American. She is from Virginia, but she has lived in London for years. She is the creator of the famous Bea’s of Bloomsbury. While she has moved on from there, she is busier than ever with her Stax, Boondocks and The Famous Flames restaurants, and the Butterscotch Bakery. While I am not a biscotti fan, I am a Bea fan! 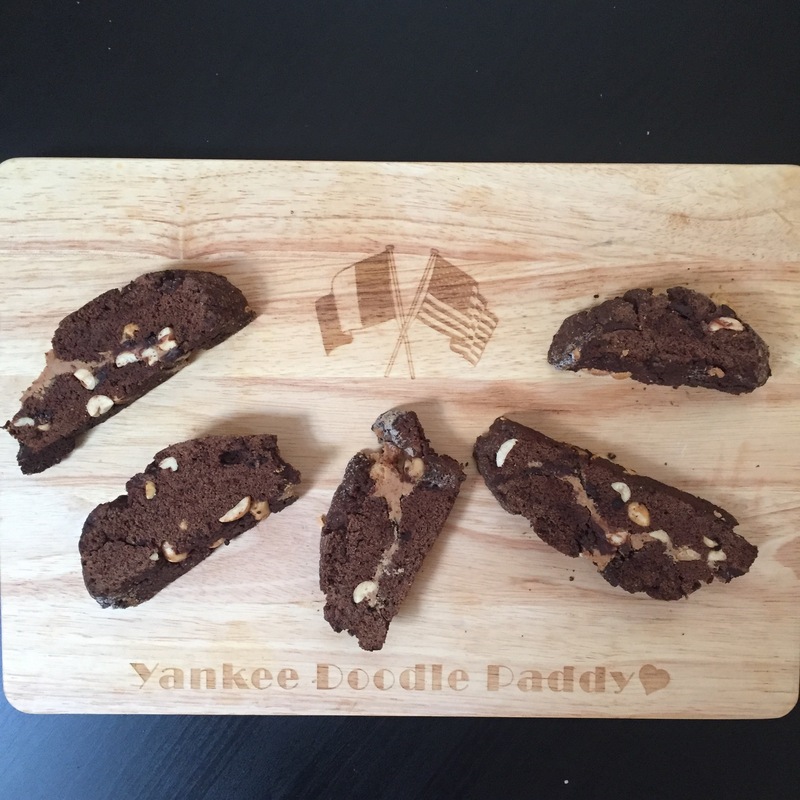 And I trust this recipe, which will be the first time I actually make biscotti of any kind, will be amazing. With Bea at the helm why wouldn’t it be? I am going to be doing a live Snapchat cooking tutorial (username blissbakery) and we will see how it all turns out! Put the golden syrup, oil, eggs, water and vanilla extract in a separate bowl and whisk until well combined. Add the dry mixture and mix until just combined and no trace of flour remains. Sprinkle the work surface liberally with caster sugar. Transfer the dough to the work surface, and flatten roughly with your hands. Dot spoonfuls of peanut butter all over the dough. Lightly roll the dough into a log about 6 cm/2 ½ inches wide and 2 cm/1 inch high. Try to encase the peanut butter into the log as it will burn if directly exposed to heat. Place the log on the prepared baking sheet and bake for 25-40 minutes until the top is hardened when tapped, feels sturdy not squishy inside. Remove from the oven and let it cool for 30 minutes. Lay batons flat on the same baking tray and bake for 10-15 minutes until nice and dry, the flip over all the biscotti and bake again for 10-15 minutes. Remove from the oven and let cool on the baking sheet for 1 minute. Well I have to be honest, because that is just me. 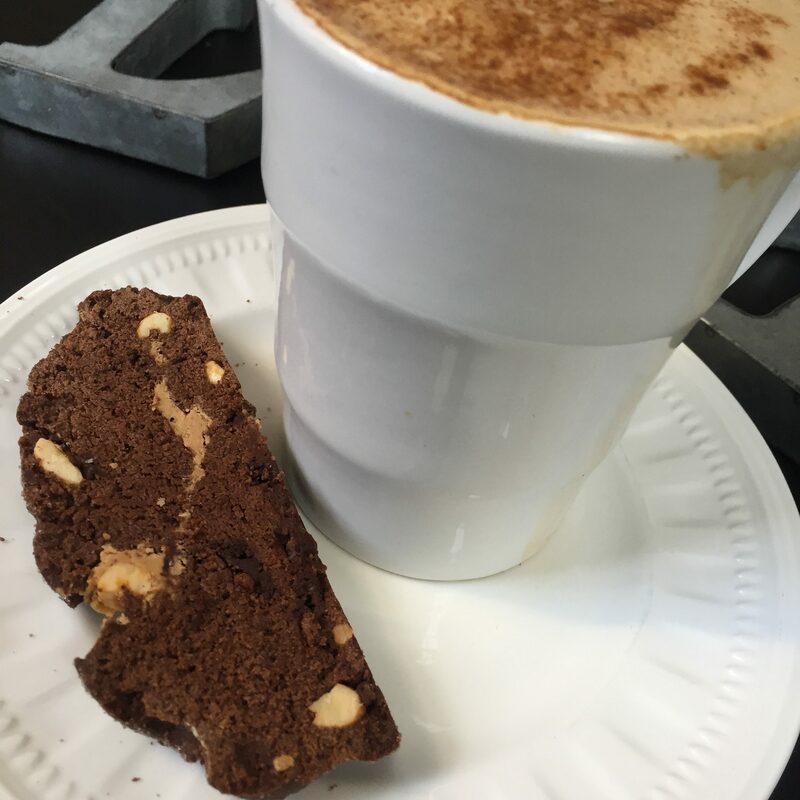 So the truth is that I LOVE this biscotti. It wasn’t too sweet, it had the awesome textures of the chocolate chips and peanuts, but it wasn’t too crunchy. I always had this fear about biscotti breaking my teeth off. LOL! But Bea definitely got me over the fear with her amazing recipe. I had an issue with the biscotti crumbling at the very last step when it is baked in the oven in slices. But I shared that in my Snapchat story. But the ones that crumbled won’t go to waste as I plan to make homemade ice cream and it will make the perfect topping. Bea is a Le Cordon Bleu trained chef so she knows her stuff. She is so accomplished I could spend days going on listing all her achievements. She is super smart and studied medicine in university. And that gorgeous gourmet gal can dance too! She even posts on her Instagram the rocking moves. I shared a bit about her when I went on a Foodie Fieldtrip Friday to her first food business, Bea’s of Bloomsbury. With several cookbooks, and lots of industry credibility, it seems there is no stopping her. 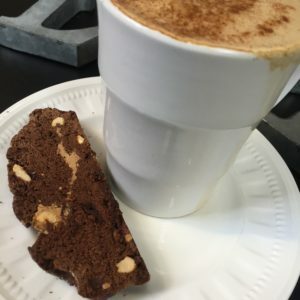 The middle biscotti I took a bite out of for the live tasting. OMG guys this really is such a delicious recipe! It is my hope to meet Bea one day. She is such an inspiration for female foodies, and also conscientious citizens of the world. She doesn’t shy away from sharing her opinions as she has a big heart and really wants to help mankind. I love that about her. I am looking forward to trying out her newest restaurant The Famous Flames, so stay tuned all you Foodie Fieldtrip Friday fans! Until then, thanks Bea for all you do and all you are!